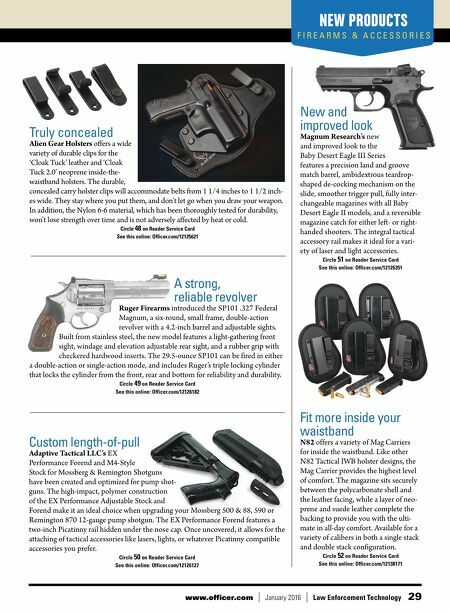 28 Law Enforcement Technology January 2016 www.officer.com TALKING POINTS analyzer can determine. The introduction of products like the Progeny ResQ utilizing 1064nm technology has increased the range of materials that can be identified using just one device, thanks to an extensive library of more than 12,000 compounds. This reduces the number of complementary techniques required for successful narcotics identification. For example, depending on the cutting agent, the 1064nm handheld Raman can identif y heroin—without the need for sample preparation kits—within seconds, and users can perform mixture analysis to identif y the correct ID of the threat in the compounded material. The ability to easily add new substances to the library is another capability to consider as new drug formulations are constantly evolving. The latest models of handheld detection systems give users the confidence that they have access to the widest range of materials possible. Technological innovation is being driven by the needs of the end user. The illegal drugs and narcotics market will continue to evolve, and we need to assess the capabilities of current technologies to ensure law enforcement profes- sionals have access to actionable intelligence at the point of need. The new generation of hand- held Raman is meant to provide users in the field with high quality evidence quickly and easily. That puts them one step ahead in the fight against the illegal sale or use of controlled substances. 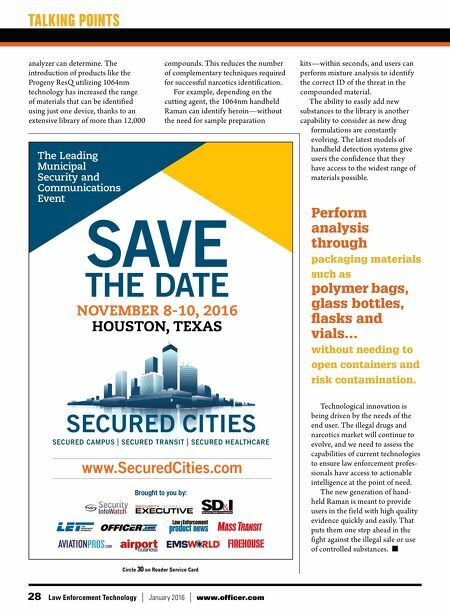 ■ ® SECURED CAMPUS | SECURED TRANSIT | SECURED HEALTHCARE The Leading Municipal Security and Communications Event SAVE THE DATE NOVEMBER 8-10, 2016 HOUSTON, TEXAS Brought to you by: www.SecuredCities.com Circle 30 on Reader Service Card Perform analysis through packaging materials such as polymer bags, glass bottles, fasks and vials… without needing to open containers and risk contamination.